Those goodies that the astronauts are awaiting will arrive thanks to another successful SpaceX launch on Monday, August 14. Resupply missions to the International Space Station are celebrated as they make the bridge to the astronauts when a favorite snack is craved or they have the need of a basic necessity — they can’t just hop into a car and head to the store — and that’s when SpaceX delivers. That’s a big thumbs-up for an astronaut’s favorite snack! On August 14, 2017, SpaceX successfully launched its twelfth Commercial Resupply Services mission (CRS-12) from Launch Complex 39A (LC-39A) at NASA’s Kennedy Space Center, Florida. Liftoff occurred at 12:31 p.m. EDT, or 16:31 UTC, and was followed approximately two and a half minutes later by successful separation of the first and second stages. The first stage of Falcon 9 then successfully landed back at SpaceX’s Landing Zone 1 (LZ-1) at Cape Canaveral Air Force Station, Florida. SpaceX and NASA SpaceX CRS-12 makes it an even dozen as this was the twelfth of as many as 20 missions to the ISS that SpaceX will fly for NASA under the first CRS contract. In January 2016, NASA announced that SpaceX’s Falcon 9 launch vehicle and Dragon spacecraft had been selected to resupply the ISS through 2024 as part of a second Commercial Resupply Services contract award. Then, on August 16, ISS astronauts Jack Fischer of NASA and Paolo Nespoli of ESA (European Space Agency) will use the station’s 57.7-foot (17.6-meter) robotic arm to reach out and capture the Dragon spacecraft and attach it to the station. The Dragon spacecraft is filled with more than 6,400 pounds of supplies and payloads, including critical materials to directly support dozens of the more than 250 science and research investigations that will occur during Expeditions 52 and 53. The Dragon is scheduled to depart the space station in mid-September, returning with more than 3,300 pounds of science, hardware and crew supplies to Earth. About five hours after Dragon leaves the space station, it will conduct its deorbit burn, which lasts up to 10 minutes. About 30 minutes are required for Dragon to reenter the Earth’s atmosphere and splash down in the Pacific Ocean off the coast of Baja California. For more than 16 years, this global endeavor, has had more than 200 people from 18 countries visit the unique microgravity laboratory that has hosted more than 1,900 research investigations from researchers in more than 95 countries. For the second time this year — and the tenth overall since entering service in 2012 — Arianespace (www.arianespace.com) has successfully launched a payload via the Vega rocket from the Spaceport, with this lightweight vehicle’s latest mission delivering the OPTSAT-3000 and VENµs Earth observation satellites to Sun-synchronous orbits. Lifting off from the Spaceport’s SLV launch complex at precisely 10:58:33 p.m. French Guiana time on August 1, Vega lofted its multi-passenger payload during a flight sequence lasting 1 hour, 37 minutes. Speaking from the Spaceport’s Jupiter control room, Arianespace Chief Executive Officer Stéphane Israël declared the launch a success and reflected on Vega’s new “10-for-10” operational record, which includes four of these successes achieved during the past 11 months. During the initial phase of the mission — designated Flight VV10 in Arianespace’s launcher family numbering system — Vega was powered by three solid propellant stages, followed by multiple burns of the bi-propellant upper stage before separate deployments of the two spacecraft. The payload fairing, which encapsulated Flight VV10’s two satellite passengers during Vega’s ascent through the denser layers of Earth’s atmosphere, was manufactured using a new “out of autoclave” production process. The first passenger released by Vega, OPTSAT-3000, is an Earth Observation (EO) satellite for the Italian Ministry of Defence. The satellite was built by Israel Aerospace Industries (IAI) based on inter-governmental, Italian-Israeli agreements. Once operational, OPTSAT-3000 will enable national defense entities to acquire and use high-resolution imagery from any part of the globe. The OPTSAT-3000 system was supplied by Telespazio as prime contractor, which has responsibility for the entire system; while OHB Italia was responsible for the launch services and related engineering support. 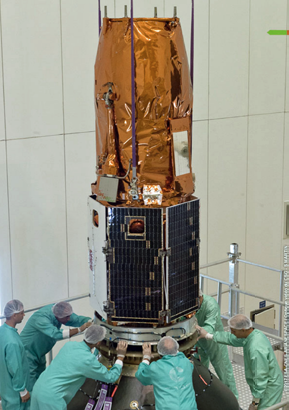 The second passenger orbited on Flight VV10 — VENµs, also produced by Israel Aerospace Industries — is an EO and exploratory mission for the Israel Space Agency (ISA) and France’s CNES space agency at the benefit of Israel’s Ministry of Science, Technology and Space. VENµs (an acronym for “Vegetation and Environment monitoring on a New Micro Satellite”) will study the evolution of Earth’s vegetation during this scientific mission, while the satellite’s technological mission will provide in-flight qualification of the Israeli electrical propulsion system, based on Hall-Effect thrusters. CNES is in charge of the multi-spectral camera, its image programming and processing, as well as the distributing ground station; while the camera’s development was performed for CNES by Elbit Electro-Optic Systems, Elop Ltd.
Peretz Vazan, Director General of Israel’s Ministry of Science, Technology and Space, called the launch a “spectacular event,” and provided his “mazel tov” (congratulations, in Hebrew) to all involved in the success. In addition to bringing Vega’s tally of successes to double-digits, Flight VV10 also marked the rocket’s first launch under a new operational organization between Arianespace and the vehicle’s production prime contractor, Italy’s Avio. Under the new arrangement aimed at enhancing competitiveness, Avio now assumes responsibility for preparing the launcher until liftoff; while Arianespace maintains full responsibility for customer relations, as well as operations for the final countdown and launch decision. Reinforcing Arianespace’s continued focus on innovation, Flight VV10’s Vega also used a new “out of autoclave” payload fairing that was developed by RUAG for the next-generation Vega C launcher, with the manufacturing process also to be applied to payload fairings for the follow-on Ariane 6 heavy-lift vehicle. Flight VV10 continues Arianespace’s busy schedule in 2017, wherein eight launches have been completed during the year’s first seven months using the company’s family of launchers (two with the lightweight Vega; two with the medium-lift Soyuz; and four using the heavy-lift Ariane 5). The company’s next mission is scheduled for early September, when Ariane 5 will lift off from French Guiana on a flight to geostationary transfer orbit with a pair of relay satellites: Intelsat 37e and BSAT-4a. Earth observation satellite OPTSAT-3000 was successfully launched on board the VEGA flight VV10 from European spaceport Kourou, French Guyana on August 2 at 01:58 GMT / 03:58 CEST. Space technology group OHB SE’s Italian subsidiary, OHB Italia (www.ohb-italia.it/), was responsible for the launch contract with VEGA and the associated engineering activities. OPTSAT-3000 is an Earth Observation (EO) program for the Italian Ministry of Defence and is comprised of a high-resolution optical satellite and a ground segment for on orbit control, mission planning and the acquisition and processing of images. The photo in the next column reveals Vega’s two satellite passengers, OPTSAT-3000 and Venµs, encapsulated within their protective payload fairing. The photo is courtesy, 2017, ESA-CNES-ARIANRSPACE / Optique video du CSG - S MARTIN. 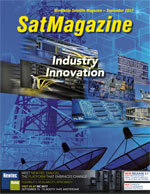 OPTSAT-3000 will allow national defence entities to acquire and use high-resolution images from any part of the globe. The OPTSAT-3000 system will be interoperable with Italy’s second-generation COSMO-SkyMed radar satellites. This will give the Italian Defence Ministry access to state-of-the-art technology, and ensure maximum operational capabilities because of the combined optical and radar data offered by the two systems. The OPTSAT-3000 system was provided by the prime contractor Telespazio, while the satellite and ground control systems were built by Israel Aerospace Industries (IAI), selected by the Italian Ministry of Defence. 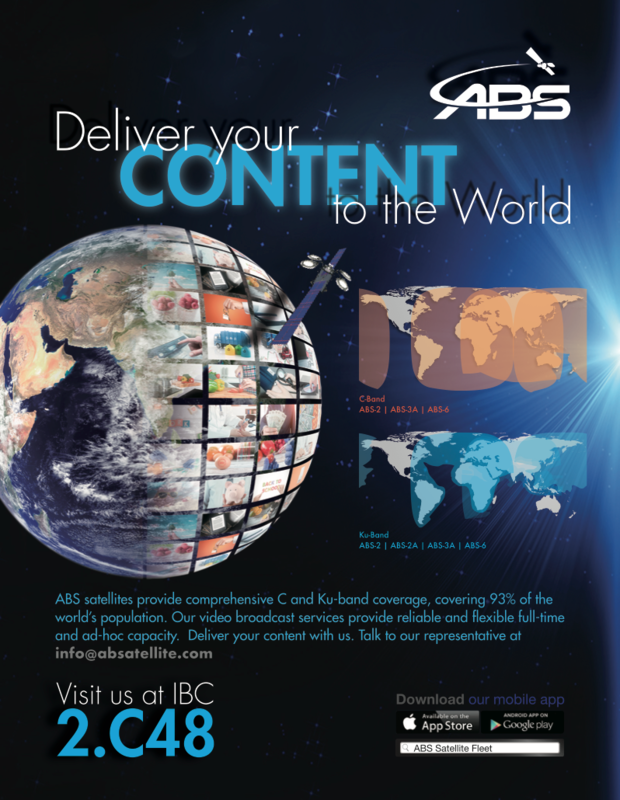 OHB Italia was directly contracted by Telespazio. Roberto Aceti, the Managing Director of OHB Italia, stated that his company’s responsibilities covered all of the launch services aspects and included engineering support directly at the space port. Milan-based OHB Italia contributed substantially by providing a variety of services prior to the launch. These included shipment of the spacecraft and the necessary ground support equipment to the space port, provision of interface rings for mounting the satellite to the launcher and for separating it in orbit, and satellite acceptance tests. Regarding management of the technical interfaces, OHB Italia assured the connection and coherency between launcher and satellite with special focus on environmental loads compatibility and satellite separation. OHB Italia also contributed to the separation system’s design that enabled the safe release of the satellite. Being the formal interface to the customer Arianespace, OHB Italia’s Program Manager acted as Director Mission Satellite during the final chronology of the launch. Two of Elbit Systems (www.elbitsystems.com/)advanced space imaging systems, Jupiter and Venus, were launched to space on August 2. The high resolution reconnaissance Jupiter imaging system (artistic rendition at the top of the next column), for the Italian Ministry of Defense, were launched onboard the IAI OPTSAT 3000 satellite. The super spectral VENµS imaging system was launched onboard the French-Israeli VENµS environmental satellite. 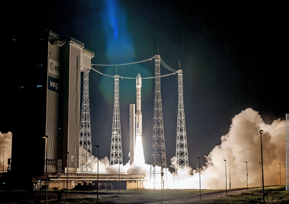 Both satellites were launched from French Guiana onboard an Arianespace Vega rocket. The JUPITER space camera provides spatial resolutions of 0.5 meter resolution (PAN) from an altitude of 600 km and is Elbit Systems’ most advanced light-weighted space imaging system developed for installation on smallsats. 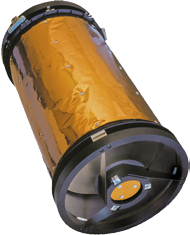 The JUPITER imaging system contains very high resolution panchromatic imaging and has the capability of adding a multi-spectral (MS) channel. JUPITER is designed for a range of military and civilian applications including advanced military surveillance and reconnaissance, detailed high value target investigation, definition of small and discrete objects and situational awareness. The civilian applications include homeland security missions, emergency planning and operations, environmental monitoring, and infrastructure imaging. The VENµS space camera features 12 narrow spectral bands with 5.3 meter spatial resolution from an altitude of 720 km. The VENµS satellite has been developed and manufactured as a joint effort between the French Centre National d’ Etudes Spatiales (CNES), the Israeli Space Agency (ISA), Elbit Systems’ Electro-optics (Elop) and Israel Aerospace Industries. The VENµS imaging system provides multi-spectral high-resolution Earth imaging, previously unmet by legacy space imaging systems for a variety of applications, including a global scale monitoring of agriculture, receding of forests and vegetation, desertification, air pollution, the detection of volcanic ashes, dehydration of water reservoirs as well as oil spills and water contamination. VENµS will play a vital role in creating guidelines for future scientific experiments and space imaging missions. Elbit Systems’ Electro-optics Elop has systems in use within a wide variety of major space programs for military, commercial and scientific applications, including Israel’s Ofeq family of satellites, the EROS program of ImageSat International and a satellite of the Korean Aerospace Research Institute (KARI). The two satellites on Vega flight VV10 were enveloped by a payload fairing that was manufactured by RUAG Space in a faster and more cost-efficient process in Emmen, Switzerland. Vega flight VV10 was initiated from the launch pad in Kourou. On the top of the rocket, protecting the two satellites, a new RUAG Space (www.ruag.com/) payload fairing debuted, one that was manufactured out of autoclave. This advanced process was — for the first time— applied for the payload fairing of a Vega rocket, after having succeeded initially on an Ariane 5. 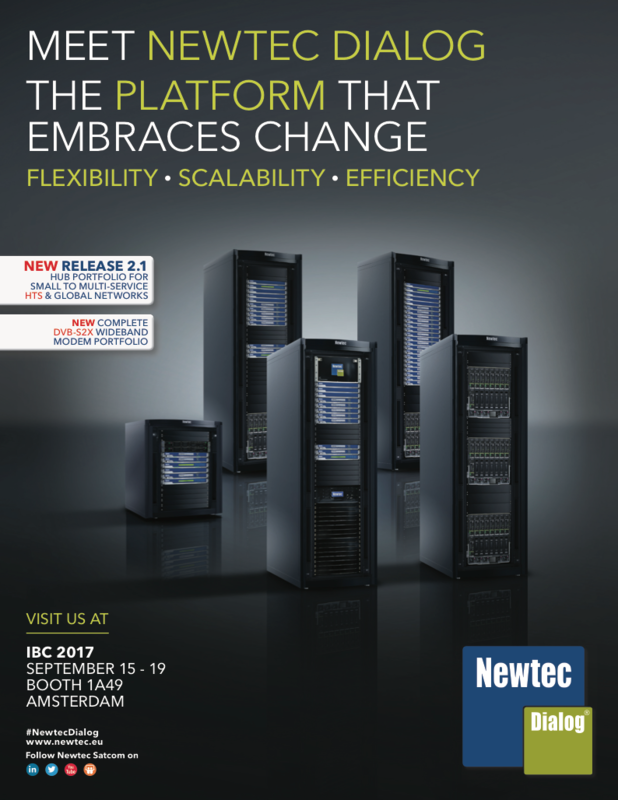 The new procedure reduces both throughput time and cost, thereby allowing for a higher delivery volume and flexibility. According to the company, with this advanced process, RUAG consolidates the firm’s position as the global leader in carbon structures for launch vehicles. In order to run it, RUAG has invested in a state-of-the-art manufacturing hall in Emmen, Switzerland. Relying on tailor-made machinery and automated processes, the new composite centre was inaugurated in 2016. The carbon-fiber based payload fairing consists of two half-shells, which separate in space. These shells are newly cured in an industrial oven instead of an autoclave. This requires less energy, and — thanks to its size — the industrial oven can cure an entire half-shell in one piece. The costly and time-consuming vertical integration of individual shell elements can be avoided. Overall, the Vega payload fairing is 7.8 meters high, and has a diameter of 2.6 meters at its largest point. Due to the out-of-autoclave manufacturing approach the fairing is around 70 kg lighter as the original fairing, cured in an autoclave. Peter Guggenbach, CEO of RUAG Space, stated that the out-of-autoclave process is quite advanced and responds to the needs of today’s space industry. Shorter lead times, less cost, flexible adjustments and higher delivery sequence — this is RUAG’s contribution to make access to space more affordable. Breakthrough Starshot, a multi-faceted research and engineering program to develop and launch practical interstellar space missions by Breakthrough Initiatives, successfully flew their first spacecraft — the smallest ever launched. On June 23, a number of prototype “Sprites” — the world’s smallest fully functional space probes, built on a single circuit board — achieved LEO, piggybacking on OHB System AG’s Max Valier and Venta satellites. The 3.5-by-3.5 centimeter chips weigh just four grams but contain solar panels, computers, sensors, and radios. These vehicles are the next step of a revolution in spacecraft miniaturization that can contribute to the development of centimeter- and gram-scale “StarChips” envisioned by the Breakthrough Starshot project. The Sprites remain attached to the satellites. Communications received from the mission show the Sprite system performing as designed. The spacecraft are in radio communication with ground stations in California and New York, as well as with amateur radio enthusiasts around the world. This mission is designed to test how well the Sprites’ electronics perform in orbit, and demonstrates their novel radio communication architecture. Breakthrough Initiatives — including most notably, Breakthrough Starshot and Breakthrough Listen — are a set of long-term astronomical programs exploring the Universe, seeking scientific evidence of life beyond Earth, and encouraging public debate from a planetary perspective. Breakthrough Starshot is a $100 million research and engineering program aiming to demonstrate proof of concept for light-propelled spacecraft that could fly at 20 percent of light speed and, in just over 20 years after their launch, capture images and other measurements of the exoplanet Proxima b and other planets in our nearest star system, Alpha Centauri. Talented folk from Boeing, SpaceX and Virgin Galactic merged their expertise and founded Arizona-based Vector, a satellite launch startup... and their work has now led to the company’s Vector-R rocket making its first successful flight. The launch is also a first from Georgia’s Spaceport Camden. In the 1960’s, this site was a NASA static test fire site for solid state rockets and was then repurposed by Vector for their launch purposes. 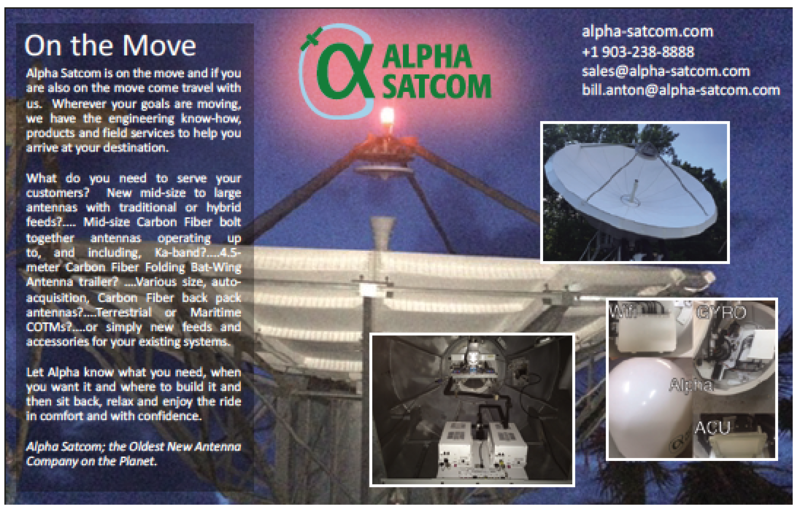 The company’s goal is to become a viable launch provider and this flight certainly illustrates success as the firm continues to progress toward their objectives, one being to become a platform for commercial payloads as well as to lower the cost of such efforts. the company in partnership with NASA’s Marshall Space Flight Center. Launch capabilities for smallsats that are reasonable as far as cost is concerned and enabling developers to build apps for space using an API through software-defined satellites are all part of Vector’s mission. Orbital launch capabilities are expected to become available next year for around $3 million. The firm recently managed to garner Series A financing to the tune of $21 million, which was led by Sequoia Capital. 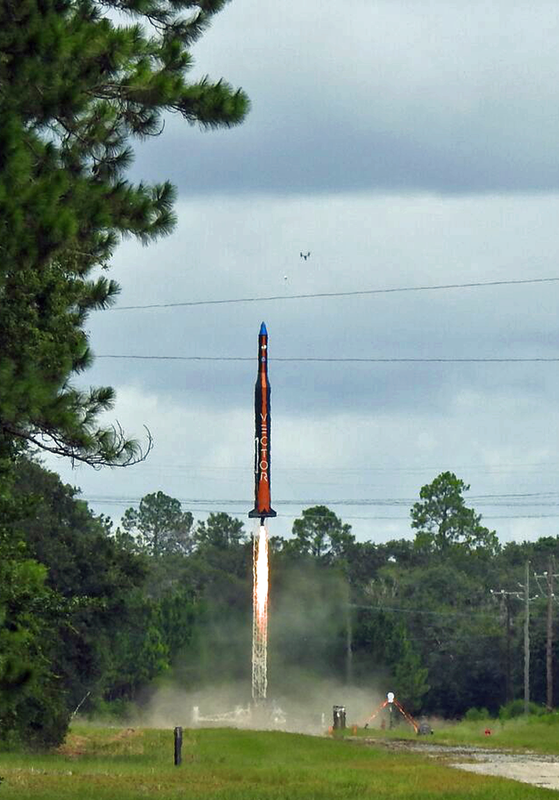 As of now, Vector states the company is on track to achieve their target of achieving orbital launch capabilities by next year — this test flight is highly encouraging as also included in the mission was a demo of a 3D-manufactured engine injector, which was developed in partnership with NASA’s Marshall Space Flight Center, and which will help it achieve its low cost launch goals.